Humus cooked up from farm scraps is the secret ingredient to boosting soils. Doing the best with what he’s got is Fromberg, Montana, cattleman and hay producer Jay Stetson’s goal. In the case of his fields, he’s working from the ground up. “It doesn’t matter how well you build a house, if it’s not on a solid foundation it won’t stand. The same goes for grass and crops, and their foundation is the soil,” Stetson says. He’s looking to firm up his farm’s foundation by producing high quality humus teeming with beneficial microbes and plant-available nutrients to apply to his hay and pasture acres. Starting in 2014, Stetson and his wife, Tina, purchased and leased their way to 900 acres of irrigated ground in the Clarks Fork River valley. They hoped to acquire enough land to support their 300-head Angus herd year-round, but summer pasture was in short supply. They pared the herd down to what they could run year-round and set out to maximize the acres they were able to secure. Faced with heavy soils prone to compaction, Stetson tried cover crop mixes to loosen the soil. But in searching for answers he came across the idea of making and applying humus to boost soil health and function. 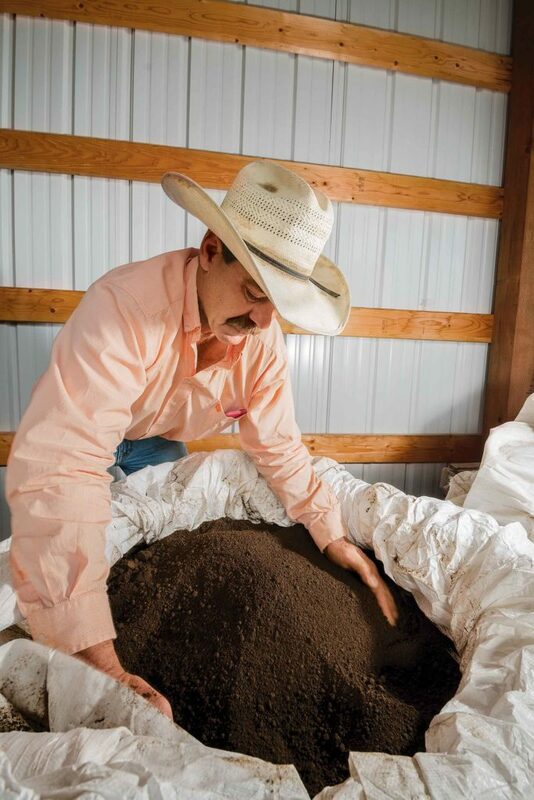 Humus he composted from manure, alfalfa hay, and straw, is helping Jay Stetson maximize hay production. Stetson is able to produce 750 tons per year to use on his fields and sell to other producers. It can be applied with a fertilizer spreader or as a liquid tea through a sprayer or pivots. Breath of life. Stetson tests all the material he composts and follows a recipe based on those test results to get the right carbon-to-nitrogen ratio. He then grinds the materials together and lays them out in long windrows. The windrows are covered and carefully monitored for carbon dioxide production, temperature, and moisture. Precise conditions are maintained to keep microbes working to break down the organic matter. Windrows are turned as needed and maintained at a temperature that kills pathogens and weed seeds. Prior to use, the humus is inoculated with beneficial microorganisms, which Stetson is particularly after. Microbes, including various bacteria and fungi, help plants draw nutrients from the soil, even those beyond the reach of the crop’s roots. “It’s like a bucket brigade,” Young says. “Plant roots send out a chemical signal to the microbes and they help the plant roots get what they need.” Young notes many producers using humus see a dramatic reduction for additional fertilizer inputs. 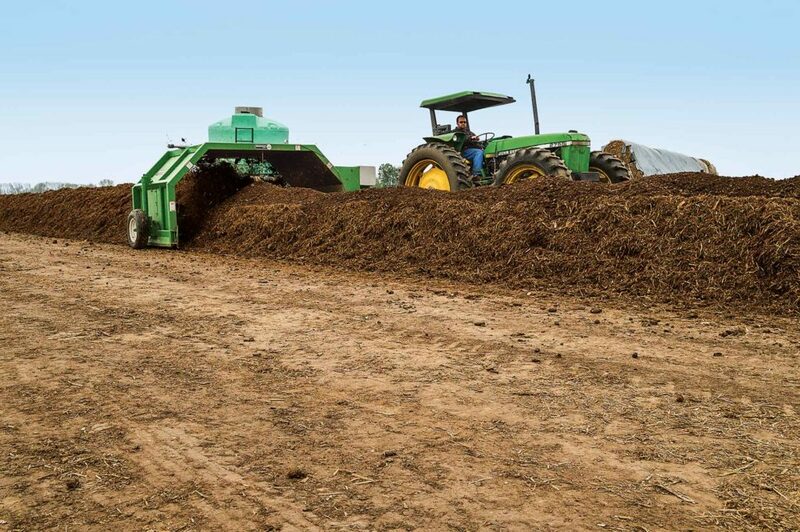 Compost is turned regularly to add oxygen for microbes and manage moisture and temperature. Stetson has also seen encouraging results. He leased a field known to be the county’s poorest producer. “I applied solid humus in the fall and the crop went on to produce about 5 tons of hay per acre. That was phenomenal for that field. And, the soil structure improved. It went from hard clay to about 4 inches of nice, crumbly soil on the surface already after just the first year,” Stetson says. Plant root exudates and soil life help build soil structure, making it more porous and, with increasing soil organic matter, better able to hold water and nutrients. “I’m expecting our water needs to decrease, which is huge as it costs a lot to run a pivot,” Stetson says. He’s hoping increased production and decreased input costs, plus the sale of humus to others, can help him build his herd again and earn some stability. “I want to get to the point where my ground is producing enough that if I lose a lease I can still sustain,” he says. Genome editing promises to change the ag landscape in the 21st century. The Irrigation Research Foundation farm is dedicated to saving water.